Alexa can play music and audiobooks, read the news, set alarms, control smart home devices, provide information like weather, traffic, sports, and more using just your voice. Amazon echo uses the alexa voice service to understand voice requests and responds with natural language. 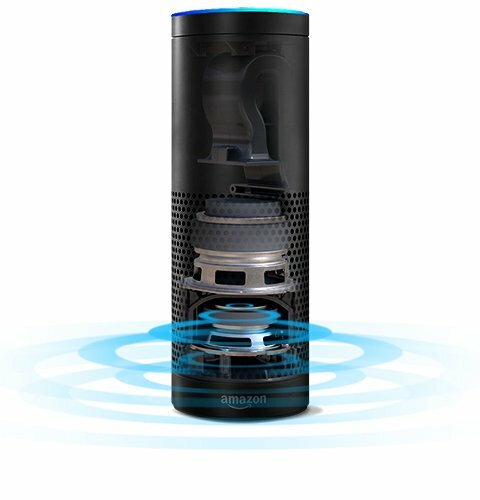 Amazon echo can hear you from across the room with far-field voice recognition, even while music is playing. With the free alexa app on fire os, android, iOS and desktop browsers, you can easily set up and manage your amazon echo. Echo has seven microphones and beam-forming technology so it can hear you from across the room—even in noisy environments or while playing music. Echo is also an expertly tuned speaker that can fill any room with 360° immersive sound. When you want to use Echo, just say the wake word "Alexa" and Echo responds. If you have more than one Amazon Echo, you can set a different wake word for each—you can pick "Amazon", "Alexa" or "Echo" as the wake word. 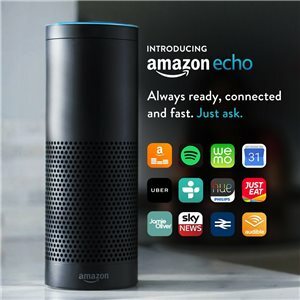 Amazon Echo provides hands-free voice control for Amazon Music, Prime Music, Spotify and TuneIn. 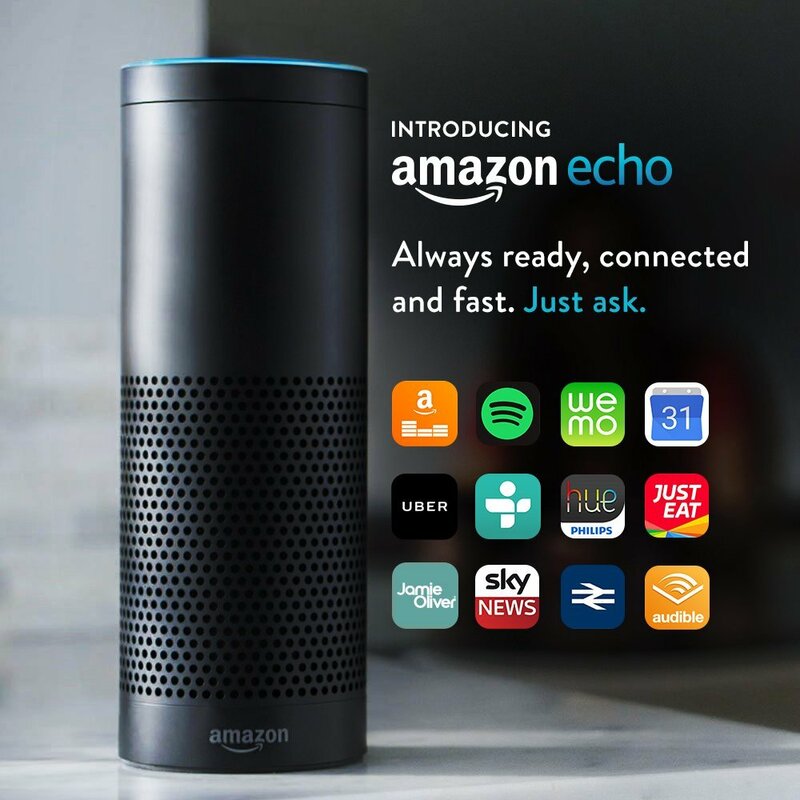 Plus, Echo is Bluetooth-enabled so you can stream other popular music services such as iTunes from your phone or tablet. Tucked under the light ring is an array of seven microphones that use beam-forming technology and enhanced noise cancellation. 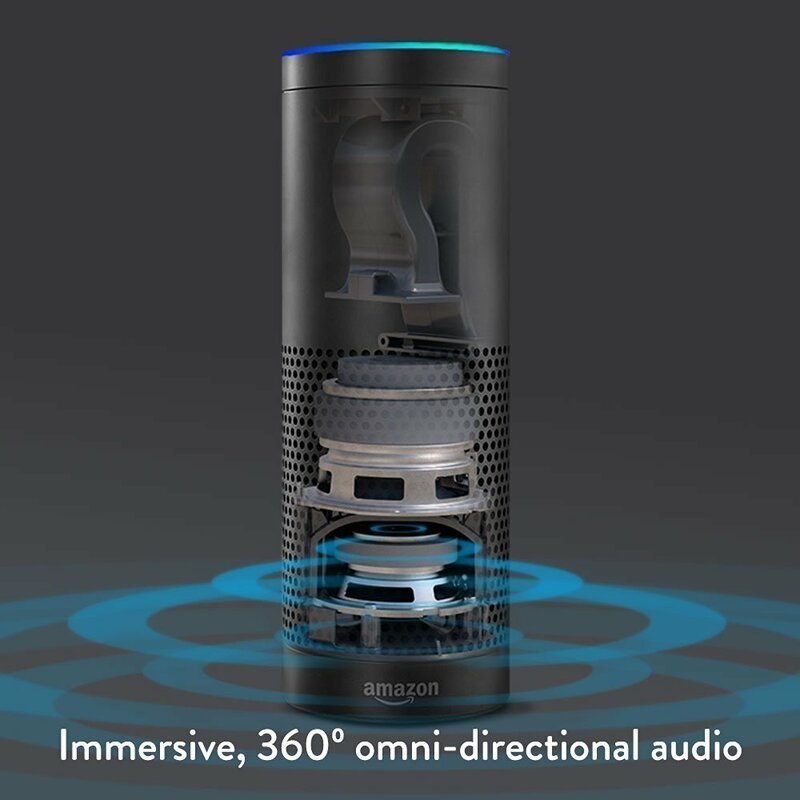 With far-field voice recognition, Amazon Echo can hear you ask a question from any direction—even in noisy environments or while playing music. When you want to use Echo, simply say the wake word, "Alexa", and Echo lights up and streams audio to the cloud, where the Alexa Voice Service is leveraged to recognise and respond to your request. Skills add even more capabilities such as ordering take away from Just Eat, requesting a ride from Uber, checking train times from National Rail and more. Enabling skills lets your Amazon Echo do even more—simply discover and enable the skills you want to use in the Alexa App. Use Amazon Echo to switch on the lamp before getting out of bed, turn up the thermostat while reading in your favourite chair, or dim the lights from the couch to watch a film—all without lifting a finger. Echo works with smart home devices such as lights, switches, thermostats and more from WeMo, Philips Hue, Hive, Netatmo, tado° and others. 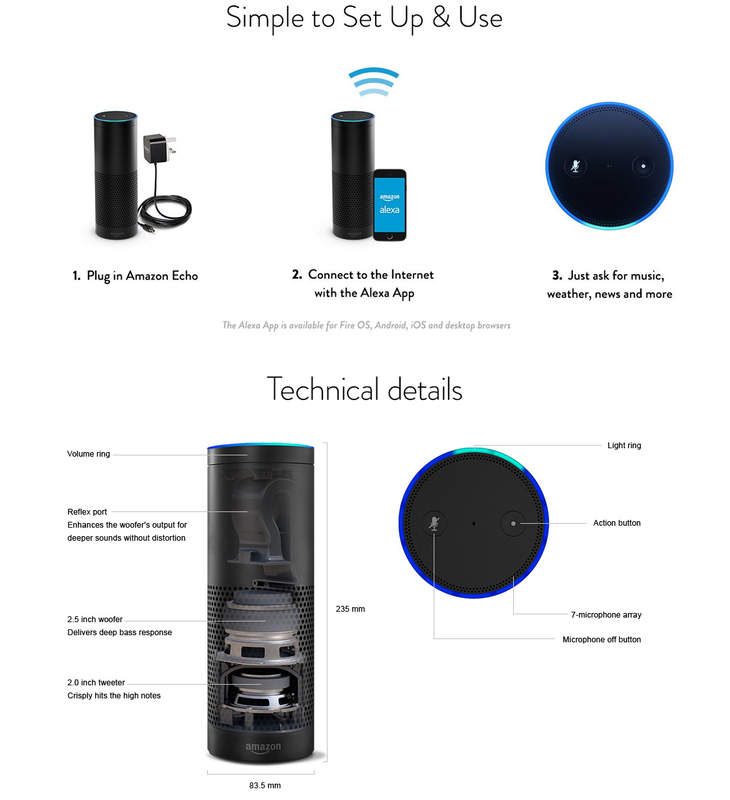 Use the Alexa App to connect services you already use such as Prime Music, Spotify and Google Calendar. Set up your smart home devices from WeMo, Philips Hue, Hive, Netatmo, tado° and more. See which books are available to listen to from your Audible library. View shopping and to-do lists while on the go. Control your timers and set custom tones for your alarms, and much more. The Alexa App is also where you discover and enable third-party skills.